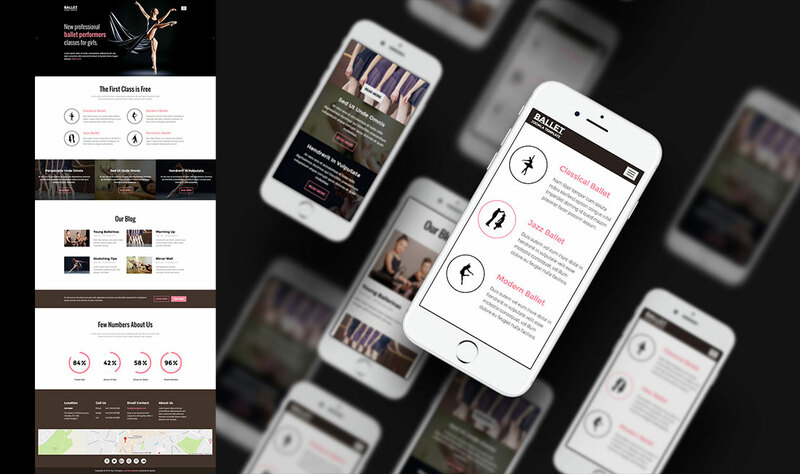 Ballet template is a responsive Joomla template dedicated to an artistic dance form performed to music. Ballet dancers use precise steps and gestures. At the same time, this template uses the latest web technologies powered by Joomla CMS to allow the ballet schools to create their web presentation easily. New version of our Hot Counters module supports the circular counters, dynamically generated as SVG icons. We are using this feature for the first time on the Hot Ballet template. Based on a clean and modern design with high contrasts, the Ballet template's home page is focused on the performers. In our demo, the performers are ballerinas. Images for the carousel have dark backgrounds, so there's enough space for textual messages. The home page of the Ballet template also acts as an entrance from where visitors can learn more about the site's services. In our sample data, that's various types of ballets. The rollover effect of these section has interesting CSS3 based animation of 3D rotation. There's one more block of the Ballet template's home page that's powered by advanced CSS3 code. Each of three intro articles in the next row has light text on the image darkened by filters. The images are fully revealed when visitor move pointer over them. CSS3 based animations improve overall user experience of your site. 5 pre-defined color styles. All colors are easily customisable from the Sparky options (infinite color options). Featured images of your articles (where available) will be moved to the top, displayed in the full width of screen and revealed through the parallax scroll effect. Total control of all menus through the framework. You can set functionalities and style of all your menus and drop them directly into the layout. Ballet template uses Off-canvas menu which allows multiple levels of menu items to be included in the side pane. We included several responsive Joomla modules with this template. Hot Swipe Carousel (retina ready), Hot Slicebox, Hot Responsive Lightbox, Hot Counters and Hot Maps module. All these modules are included with this template without additional fees (you save $15 per commercial module). This template has been tested with Chrome, Edge, Firefox, IE9+, Opera and Safari browsers on PC and Mac computers. It's also tested on iOS and Android mobile devices.